What are the main benefits and features of spread betting? Spread Betting is a way of placing bets on the financial markets. You can place bets on share prices, commodities, currencies and stock indices. Financial spread betting is attractive to some as it is currently tax free*. It can be a good place to start trading, as it allows you to place smaller bets on your chosen market. However, many investors see spread betting as gambling – the market is synthetic, and you do not have direct access to the underlying market. Spread Betting is leveraged. This means that profits can be magnified. However, it is important to remember that potential losses are also magnified. 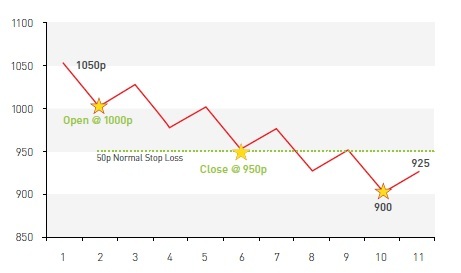 Before you begin Spread Betting with Accendo markets, we’d like to ensure that you are familiar with the mechanics involved and take the time to look through some trading examples which demonstrate potential trading scenarios. *Under UK tax law, which may be subject to change. Tax treatment will depend on your individual circumstances. You, the investor, have a positive view on the direction of Anglo American’s shares. Currently trading at £10, you believe they can go as high as £11 – the equivalent of 100p or 100 points higher. Wanting to make around £1,000 you decide to place a Spread Bet which puts you Long to the tune of £10 per point. On the equity markets, Anglo American shares are trading with a bid/offer spread of 998p/999p. Given that Spread Betting attracts no explicit commission or stamp duty, the Spread Bet price incorporates a spread of 0.1% on the equity market bid/offer. This means that Spread Bet bid/offer price would be more like 997p/1,000p, and at £10/point the trade value thus equates to £10,000 (1,000 points x £10 per point)(1) . An easy way to calculate your exposure is to remember that for every £1 per point that you hold in a position, you gain exposure to 100 shares. In this example, Accendo Markets offers Anglo American Spread Bets on a 10% margin (margins vary between 5% and 25% depending on the stock, and liquidity), meaning a deposit of only £1,000 (£10,000 x 10%) would be required in order for you to gain the full £10,000 exposure(2) . Note that the Initial outlay for a position in traditional shares would of course be the full £10,000. After 8 days, Anglo American’s shares have risen by 10% (100p) to 1,100p. You decide to close the trade and realise the 100p profit per share. Alternatively, after 8 days, Anglo American’s shares have fallen by 10% (100p) to 900p. You decide to close the trade and realise the 100p loss per share. and GappingTaking Example 3 a step further, should the shares be particularly volatile and gap (trade straight through) the 950p stop loss, the position would be closed out at the next available price, in this example at 940p,resulting in a loss of 60p per share. After 8 days Anglo American’s shares had risen as high as 1,100p and then fallen back to 1,000p. 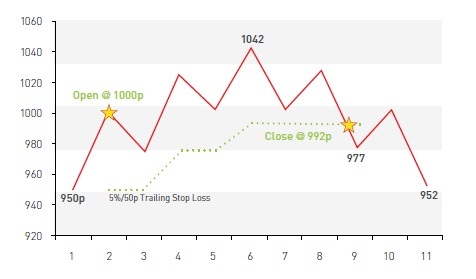 Given that a 5% Trailing Stop Loss had been placed when the trade was opened, the initial stop at 950p followed the shares up to the high of 1,100p and revised the stop to 1,045p, locking in a gain of 55p per share. Note, as in example 3 and 4, the possibility of slippage remains, and the position could be closed out below the revised stop depending on where the order can be executed. Trailing stops incur no additional cost. 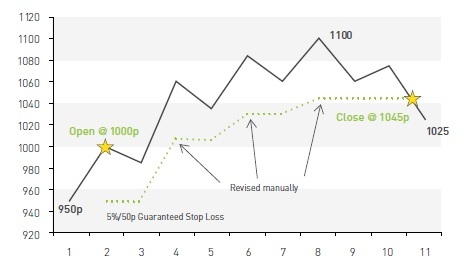 Trailing stops cannot be placed nearer than 1 tick/ penny from the current share price (6). (6) Revisions take place automatically when positions move into profit. Minimum increment for revision is as small as 1 tick/penny (subject to change). After 10 days Anglo American’s shares had risen as high as 1042p and then fallen back to 952p. 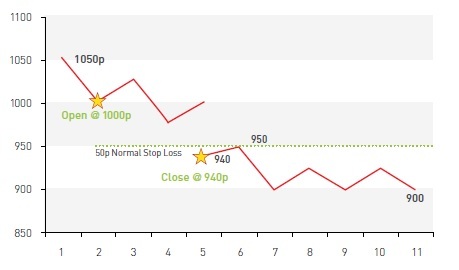 Given that a 5% (50p) Trailing Stop Loss had been placed when the trade was opened, the initial stop at 950p followed the shares up to the high of 1042p and revised the stop to 992p, reducing the potential loss to 8p per share. 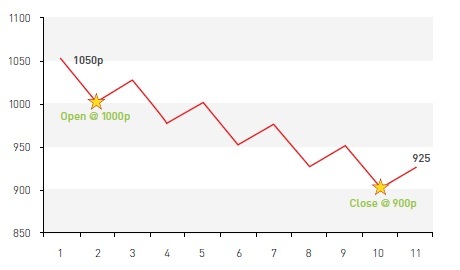 Note, as in the example of a Normal Stop Loss, the possibility of slippage remains and the position could be closed out below the revised stop depending on where the order can be executed. Trailing stops incur no additional cost. 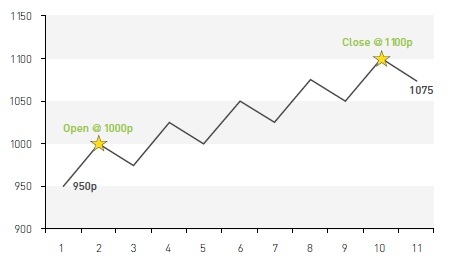 Trailing stops can never be placed nearer than 1 tick/penny from the current share price(8) . (8) Revisions take place automatically when positions move into profit. Minimum increment for revision is as small as 1 tick/penny (subject to change). All of these examples work in exactly the same way in reverse i.e. you take a negative view, borrow the shares and sell them short except that financing would be lower if the share price falls in value as the ultimate exposure value would have fallen. * Financing based on total exposure and calculated daily. Trade technically closed at official close price each day and reopened at same price but adjusted for daily financing cost. In the case of a short position, financing is calculated based on LIBOR minus 3%. Your account is thus credited with interest unless LIBOR is less than 3.0%, in which case short positions will incur a debit.